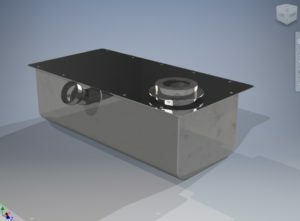 At Yorkshire Profiles, we have a wide range of CAD/CAM software packages to ensure that we can not only open the files you are able to provide us with, but also use the best software solution to amend designs for better manufacturing techniques, or to help you bring your ideas to life. This allows us to provide you with a complete design and fabrication service. Our Autodesk license provides us with a complete design package. From AutoCAD Mechanical for 2D metal profiles and technical drawings, to Inventor Premium which allows us to create complex 3D metalwork assemblies to ensure fitment, hole alignment and check for any design issues. Inventor is our preferred choice of software for our design and fabrication service, however it can open any Solidworks files you may have. If you in the industry and you work with Amada machinery, you may be aware of this software package. This software is used for simple 2D profiles and saves them directly into our laser cutting database for quick retrieval and program creation. This is our nesting software. It ensures that the best material size is chosen and that it is utilized effectively reducing waste and therefor reducing the overall cost of the parts being cut. It automatically choses the correct number of ‘microtags’ to hold the parts in place and choses the optimal machine path to keep movement times to a minimum. By keeping the software settings ‘tweaked’ we are able to reduce the time taken in the office to produce effective programs. The final part of this package allows us to open isometric drawings and convert them into a 3d component (as long as they have been drawn accurately). It also allows us to open components which have been drawn as “extruded” parts rather than sheet metal (the difference is in the bend radius) and convert them into more accurately developed parts. Register for an online account and you can create your own quotes instantly, 24/7! If it's just flat profiles you require, you can use this service to place orders today.